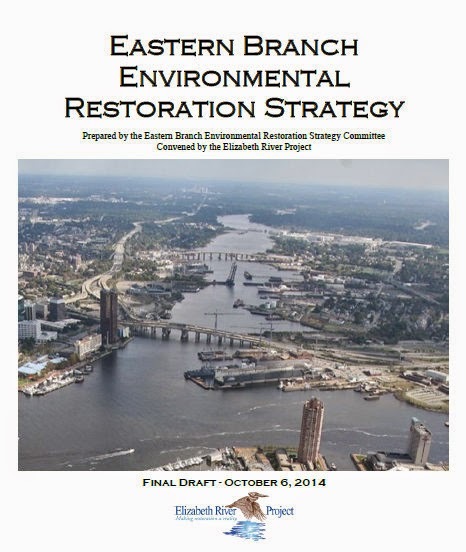 Here is the link to the new Eastern Branch Environmental Restoration Strategy developed by the Eastern Branch Steering Committee convened by the Elizabeth River Project. The Steering Committee had participants from citizen groups, non-profits, local businesses, and government organizations from across Norfolk, Chesapeake, and Virginia Beach. The Eastern Branch Environmental Restoration Strategy is a plan to mobilize government, business, and citizens to improve the quality of the Eastern Branch ecosystem - and the quality of life for the residents of the area. Key actions include engaging residents and giving them a stake in the river, restoring wildlife habitat, restoring clean water, and cleaning the river bottom. Also the State of the Elizabeth River, Scorecard 2014 was released in 2014. This scientific data set and analysis was compiled by the Virginia Department of Environmental Quality and the Elizabeth River Project. Overall the Eastern Branch got a grade of "D". The Indian River got a grade of "F" due to excessive Nutrient and Bacterial Contamination. On the plus side, we did get a "B" for the amount of Dissolved Oxygen in the water, which is a good sign. This scorecard gives us a baseline to measure future improvements. At our last meeting, ​I mentioned that the Hampton Roads Planning District Commission is working on a community-based Regional Strategic Plan for Hampton Roads and is looking for your input. They are holding a "Vision Session" at the HRPDC buidling on Woodlake Drive, 723 Woodlake Drive, (just off Greenbrier across from the Wawa) this Tuesday the 27th at 5:30 pm. It should be an interesting meeting. On Saturday we finally got the new native plant garden installed at Indian River Park. The plants mostly don't look like too much right now, but giving them this extra time to acclimate to their new home will give them a great start in the spring. A big thank you to the 20 enthusiastic volunteers who came out on this chilly morning to get the job done. Kudos to Amy Weber for her work on designing the garden layout and planning the event. Also, thank you to Eric Gunderson and Southern Branch Nursery, Inc. Besides being the source for the native plants for the garden, Southern Branch Nursery donated several extra plants for the garden and Eric stayed through the morning to help plant and provide his expertise. Next we'll be working on getting identification signs placed on the plants. You can find some more photos of today's work at our online photo album. We held our Annual Meeting on the 15th and held elections for our Board of Directors. We have one departing board member, Keith, who we would like to truly thank for his service this past year. And we welcome our newest board member, Sara as a Director At-Large. Our other Directors At-Large are Sharon and Amy; our officers are Secretary Helene, Treasurer Jayne ,and VP Diane and Rogard continuing on as President for another year. We also talked about our goals and projects for the new year. We're continuing most of existing efforts around Community Beautification, improvements to Indian River Park, Education and Outreach, and various interactions with the City. A new focus in a greater partnership with the Elizabeth River Project and supporting the new Eastern Branch Environmental Restoration Strategy. As various efforts and events get under way, keep an eye out for our calls for volunteers. And, if you have a particular interest, skill, or trade that you would like to use to volunteer to help the community, let us know. There are so many possibilities and we'd love your help.